Good morning wow nearly time for Old St Nic to come calling. Talking of St Nic over at Crafty Catz this week we have Sparkle & Shine as our theme and I have used a old stamp with St Nic on. Now this stamp a few years ago was the hottest thing going and it was going for silly money on ebay. The stamp is by Rubber Stamped called Santa Collage. Well I think this sparkles and shines dont you. I just LOVE this vintage Santa image and you've showcased him beautifully! Thanks so much for playing in our ‘CHRISTMAS’ challenge at Dies R Us! Please come back again soon! Absolutely gorgeous Sue. Love the image and all your gorgeous details. Stunning card! 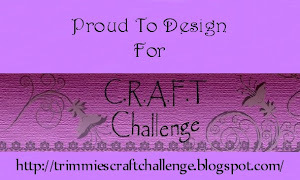 Love the design :)Thank you for playing along with us in the DIES R US challenge! Stunning card Sue! I love that Santa image and your beautiful details, that snowflake is gorgeous! Thanks so much for joining us at Creatalicious this month! Fantastic card, thank you for joining us at Craftyenjoyments and hope to see you soon. Beautiful card! I love the image and all the pretty embellishments. Thanks so much for joining us at Let's Craft & Create. A lovely card. Thank you for joining our challenge at One Crazy Stamper this month. 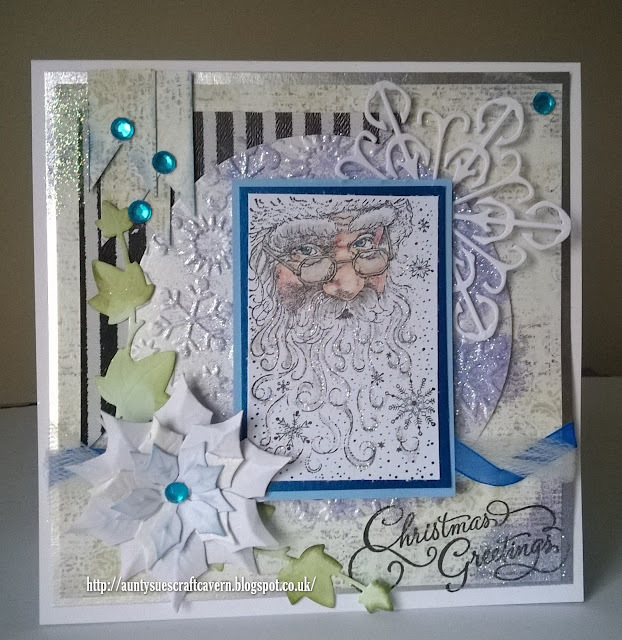 What a Fabulous card thank you for Sharing it with us over at The Artistic Stamper. Wow really beautiful card! 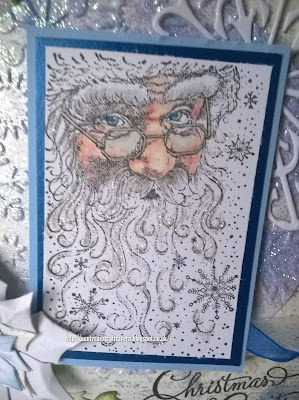 Glittered Santa. Really nice project!thank you for joining CraftyEnjoyments challenge. Stunning card, thanks for joining in with the Sisters of Craft challenge ! Best Wishes, Anne(DT). Beautiful Christmas card! I haven't seen this image in a few years, but it's lovely to see it again, it's so gorgeous. 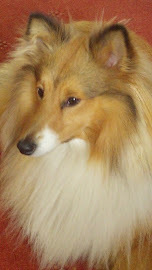 Thanks for joining LLC for our December challenge; please note for future entries that we have a max 10 challenges rule. HNY!